Siraj Jabbar Kazim, a student from the Department of Architecture at the University of Technology got a master's degree in excellence for his thesis titled " "
The researcher concluded that the current era is concerned with the use of digital technology and its technologies as a distinguishing feature of it, which is invested by man in his quest for knowledge and science in unlimited simulation in virtual worlds to organize his environment and his real world in an integrated and harmonious manner whose effects were reflected in all fields of knowledge Including architecture. Since the end of the last century, there has been a qualitative shift and a radical change due to progress in knowledge, science and technology, as well as the connection of contemporary design and architectural concepts. 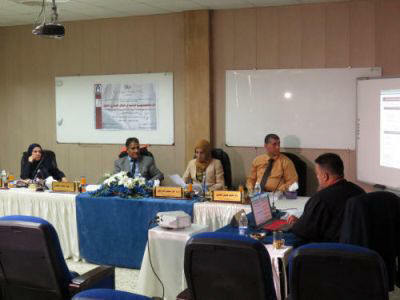 The discussion committee is chaired by Prof.Dr. Hamza Salman, and the membrane of Asst.Prof.Dr.Anwar Subhi, Lect.Dr.Berzat Qasim and Asst.Prof.Dr.Basim Hassan as a member and supervisor.